Back in full-swing comedy mode, Jeff Lucas brings his wit and wisdom to the quirks of everyday life and faith. Jeff Lucas returns with a new humorous read to brighten your day, and bring you a few extra laughs and lessons about life. 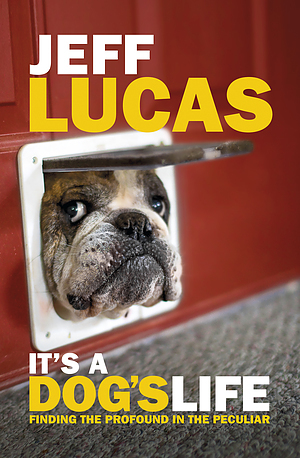 It's a Dog's Life brings you a whole new book of observations from one of the most loved Christian authors in the UK. Life is funny, in a peculiar sort of way. And in these looks at everyday life, Jeff discovers all manner of profound truths in the strangest of places. Dogs and delivery men, friends and strangers. All-round there are small ways in which the strangeness that can teach about faith, and about the little quirks life throws at you. It's a Dog's Life is ideal for dipping into every now and them. Each little anecdote tells of the amusing day-to-day adventures of Jeff Lucas, and is a great little blessing on a cloudy day. It is a book you can read anywhere and be blessed. Even if it's just a few life lessons on the loo! It's A Dog's Life by Jeff Lucas was published by CWR in March 2017 and is our 2028th best seller. The ISBN for It's A Dog's Life is 9781782595434. Be the first to review It's A Dog's Life! Got a question? No problem! Just click here to ask us about It's A Dog's Life. Following on from The Cactus Stabbers, Jeff is back with another collection of humorous and heart-warming stories from his life and travels as a pastor. Writing in his usual witty and wise style, Jeff takes an honest look at everyday life, as he learns from friends, total strangers, delivery men and, yes, dogs.